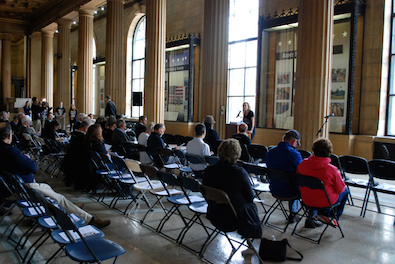 Last week, the Illinois Policy Institute held a rally at the State Capitol for Taxpayer Advocacy Day. The event was covered by Rich Miller at Capitol Fax with exactly the kind of dismissive derision that you would expect from Rich Miller. He pointed out that the t-shirts provided by IPI were made in Bangladesh because … well, I have no idea why. And I don’t know that he does either. And finally, he links to this tweet to assert that “of course, the teevee people apparently think it’s all organic.” I don’t know how he gets that from that tweet, but here we are. Those wouldn’t exactly fit his narrative of the turnout being “a bit light.” For what it’s worth, IPI says the total turnout for the event was approximately 100 people. Also, I should add that, as Miller pointed out in his post about the IPI rally, they were encouraging attendees to lobby GOP legislators to uphold Gov. Rauner’s veto of the union arbitration bill, HB580. Today, Speaker Madigan held a vote in the House to try to override the veto. It failed. Even if the turnout didn’t meet the standard for relevancy and importance in the mind of the almighty Rich Miller, it certainly seems they were effective. But I doubt we’ll see that pointed out today at Capitol Fax. Head on over to Capitol Fax today and you’d never even know that this event is happening. No dismissive post about the size of the crowd. No pointlessly pointing out where t-shirts were manufactured. No condescending to TV reporters about whether this rally is “organic” or not. Because that wouldn’t fit the narrative. Rich Miller. He’s so clever.